The Hawthorn West house is a sustainable renovation featuring a greywater system, solar panels and numerous energy efficiency features. 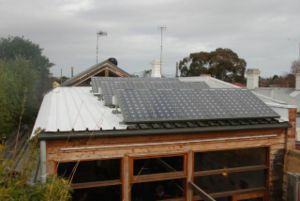 Solar power (1.35 kW grid connected), consisting of 18 X 75 watt panels. Estimated power was 1.4kW, actual power is 1.75kW. ASKO dishwasher saves 11,000 litres compared to hand washing dishes per year. The property is covered by heritage overlay control. The new design restores the 1890’s style verandah and picket fence and includes appropriate heritage colours. The solar panels and solar hot water service, water collection and greywater systems had to be hidden from the streetscape. This was quite a challenge for a very small site of 203m2. The finished renovation resulted in a warm comfortable small family home that works both spatially and environmentally. The rear wall of the house faces north on its short axis. The original unrenovated house had a rear wall with a smattering of outhouses and no north facing windows. A mezzanine level was created to house a generous study with roof storage access. The additional height was used as an inlet point for a heat shifter which takes additional warmth from the north rooms via a fan into the south rooms which receive no sun. Highlight windows were created on the east façade to provide additional heat gain and natural daylighting. These windows had to be sufficiently high to avoid overlooking of neighbour’s private open spaces. The extension was constructed on an onground slab and the old timber floors to the front 2 rooms and hallway have been insulated with Air Cell under the external joists to improve thermal performance. Residents of Australia, (performing such insulation energy improvements) may be eligible to take advantage of the current Australian Government Insulation Grant program. Approved insulation installers can perform installation at a heavily subsidised cost. The active sustainable features designed into the home include, a grid interactive PV system,grey water treatment and recycling, water catchment tanks, a gas boosted solar hot water system, and use of recycled and plantation timbers. The external walls are a combination of rendered fibre cement sheet, cypress macrocarpa weatherboards and AAC blockwork. Cypress marcrocarpa is sustainably sourced from wind breaks. Both products were chosen for their low embodied energy and in the case of the AAC blockwork its inherent insulation properties. The unique nature of AAC also contributes to some thermal mass. The internal timber posts were made from recycled ironbark. Recyled jarrah and mountain ash was used on benchtops in the kitchen with New Age Veneer in Tassie Oak on the cabinets. The mezzanine floor is recycled messmate. 3,000 bricks were cleaned and reused for the party wall and rear battery room. The original house Baltic pine floorboards were also reused. The turned verandah heritage posts were custom made from recycled ironbark because off the shelf heritage posts are made from virgin imported rainforest or native timbers. The owners have been in residence since October 2002 and have reported the passive cooling to be excellent with a maximum internal temperature of 28 degrees on a 40 degree day. The gas consumption is 1/3 of previous usage for this time of year. Town water was used during the 2006 drought. The water collection system has been tested for purity, the ecoli count for first usage was 9/100ml and the PH was 7.3. It is now testing at 0 after the system has been in use for a some months. The greywater treatment system has provided clear and odourless water since installation. The system features aeration and UV treatment of the greywater and uses a 1000 litre reservior tank which is concealed under the rear decking. It is estimated that the system has provided 35,000 litres of water during 2006. The owners are delighted with the performance of the home and the sustainable systems in particular. Their quality of life has been dramatically increased by the renovation both spatially and comfort conditions. This page was last modified 03:06, 12 October 2009. This page has been accessed 25,336 times.